I can’t remember how exactly I stumbled upon this book. I believe I saw it as I was browsing through the Barnes and Noble website (since it was one of their recommend books). The title drew me in,and the overview also got me interested enough to buy it. This book has many of the elements I like in books: mystery, historical fiction, murder, art, love, tragic love, intrigue. 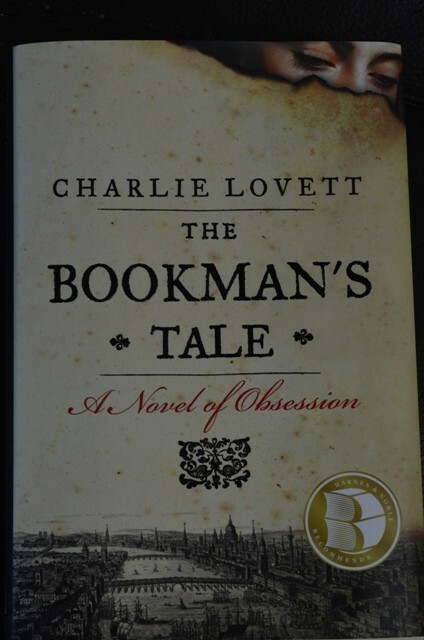 I thought it was well written and displayed a true love of books and book readers. I’ve been a big reader all my life, though I’ve been trying to read more books these days. I enjoy taking a whole weekend or a day to curl up with a book (preferably with the rain pouring down outside) and read it cover to cover. That is the effect this book had on me. It sort of just sucked me in on Sunday afternoon and I didn’t want to stop until I read the entire thing. The book has three story strands, presented in alternating chapters, that all come together in the end. The first part was set in 1995 (the book’s present day). That storyline finds American Peter Byerly, a young widower trying to work through the pain of losing his wife Amanda nine months earlier. He tried to do that by running off to his cottage in England to get away. He is a book antiquarian by profession, and specializes in acquiring rare books and restoring rare books for customers. While going through books at an antique bookshop, he stumbles upon a watercolor, painted in the Victorian age, of a woman who looks exactly like his dead wife. This storyline is his investigation into the origin of this painting and identity of the woman. In the process, he gets drawn into a mystery involving an Elizabethan playbook, Pandosto, written by Robert Greene, that supposedly Shakespeare used as inspiration for A Winter’s Tale, and included written marginalia in the play that conclusively proved that William Shakespeare was the author of all Shakespeare’s plays, and not another, such as Christopher Marlowe, Francis Bacon, or the Earl of Oxford. Peter’s modern day quest is supported by the second storyline, which is the journey of the Pandosto from 16th century England to present day that traces the origin of the Pandosto playbook and follows it through its numerous owners, and how this important treasure became lost to the world, only to re-emerge in 1995 England. The third storyline starts in 1983 at Ridgefield University in North Carolina, and traces the love story of Peter and Amanda from how they first met at university, the deepening of their relationship, their subsequent marriage to each other, and all the way up to her tragic, untimely death. This story is not merely a mystery or a historical fiction, but also a love story. This love story helps underpin the rest of the book, because it is through the telling of Peter and Amanda that you come to understand them both and the love they shared. After all, it was the mystery of the woman’s identity in the watercolor that started Peter’s investigation. Peter’s quest originates from his need to find out who the woman in the painting is, and part of him hopes this new obsession will help him come to terms with Amanda’s death, who died suddenly at the age of 29 from complications from surgery to remove a brain tumor. I personally felt their love story was very compelling and very relatable. Peter is extremely introverted and suffers from social anxiety and really only feels comfortable in the world of books. He sees Amanda in the library and he becomes entranced by her, but she is the one who eventually pursues him and gets him to open up. These two people bond through their shared passions and the comfort each brings the other. I personally related to this storyline, not because of how it mirrors any personal experience I’ve had, but the fantasies I’ve had about relationships. It was a relationship I could see myself in, and the characters I could see myself in. It also played to my fears that if I ever do find myself in a mutual love relationship, that one of us would die an untimely death and leave the other to grieve and carry on with life alone. The three storylines all come together in the end, and I felt the author, tied it all together well in an engaging and believeable way. The ending sort of reminded me like the National Treasure movie or The DaVinci Code, only in the sense that a long held historical mystery is revealed, and not that there was any big chase scenes more appropriate for an action movie. This is definitely a book for book lovers, for those of us who take pleasure and refuge in books, and only wish there was more time in the day to read more books. The mystery at the heart of the book is engaging, and the ultimately tragic love story between Peter and Amanda tugged at my heartstrings, even though at the end, Peter finds himself on the road to recovery by fully integrating Amanda’s death and moving forward with life. This entry was posted in Books and tagged art, books, Charlie Lovett, death, England, historical fiction, murder, mystery, romance, Shakespeare, The Bookman's Tale, tragedy, Victorian, watercolor.